Bourbon Mint Lemonade - our Signature Summer Cocktail! Only 3 ingredients - bourbon, mint and Simply Lemonade. So light and refreshing! Mix up a pitcher for your next summer BBQ! It's summer and time to fire up the grill with friends. We had a few people over for dinner last weekend. We grilled out and had a great time visiting. When we have people over, I like to make a pitcher of my current signature cocktail so everyone can easily grab a drink. Last week I made this Bourbon Mint Lemonade. OMG! SO delicious! It is my new go-to summer cocktail. I love everything about this drink. It tastes delicious and only has 3 ingredients - bourbon, Simply Lemonade® and mint. It is so light and refreshing! This Bourbon Mint Lemonade is perfect for summer cookouts, sipping by the pool - really anywhere and anytime. The star of this cocktail is a carafe of Simply Lemonade. We are big fans of Simply Beverages™ in our house. We always have a carafe in the fridge. 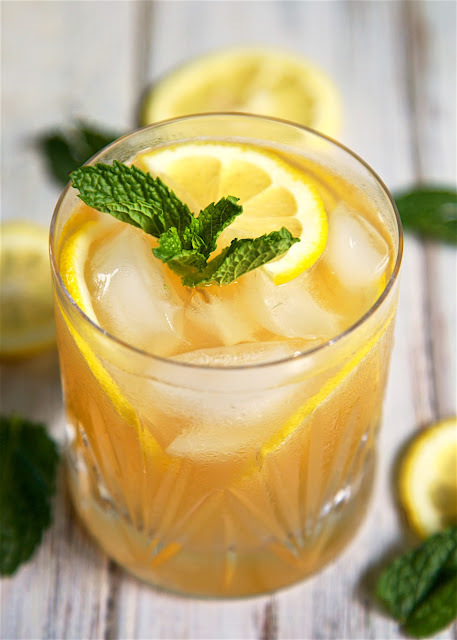 They are great over ice and perfect for mixing cocktails - like this Bourbon Mint Lemonade. 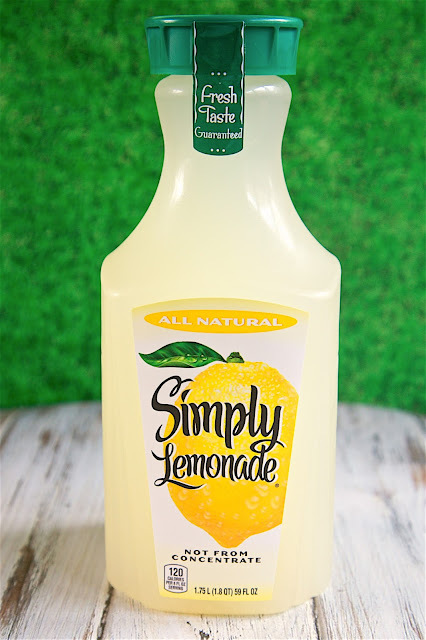 We love Simply Lemonade because it is all-natural. It is made with no added preservatives, colors or artificial flavors. It tastes great and is SO much easier than making lemonade myself!! 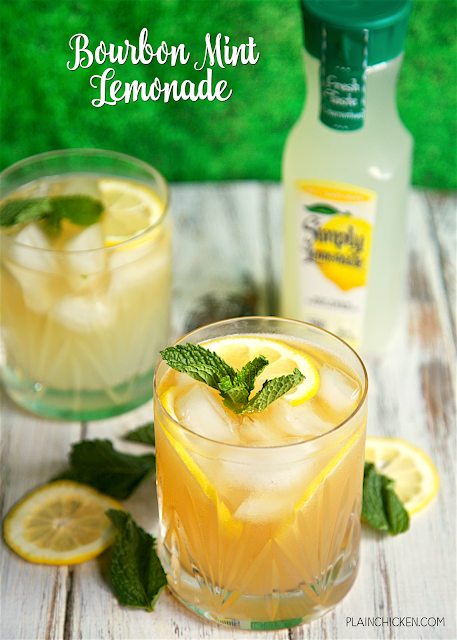 Make sure to grab a carafe on your next grocery store trip and mix up this delicious Bourbon Mint Lemonade. You can mix it up today and it will keep for several days in the fridge. It is perfect for all of your summer entertaining! Combine Simply Lemonade, bourbon and chopped mint. Stir to combine. Refrigerate until ready to serve. Garnish glasses with lemon slices and mint leaves, if desired. I will keep cool by swimming in the pool and drinking ice cold drinks and staying in the shade! We call this Tennessee Lemonade....made with Jack Daniels, of course!!!! I will keep cool with bourbon lemonade ... i love it! I will keep cool in air conditioning...I'm what you call an "indoorsy" girl. I keep cool by drinking lots of fluids, air conditioning, and doing outside activities early in the morning. I'll be keeping cool by enjoying some Simply Lemonade with a dash of lemon lime soda. Thanks so much. We are staying cool this summer by the pool! This drink sounds delicious and perfect for adult poolside time! I will keep cool by sitting in the shade and watching my kids play in the pool. We are going to spend a lot of time by the beach and pool this summer. I keep cool by drinking lots of sweet tea. I’ll keep cool with refreshing drinks and foods and air conditioning! Stay close to the pool! I will try and stay cool by being at the pool/lake and drinking cold beverages. I keep cool with an outdoor water mister when we're hanging out on the patio. I'll keep cool this summer by going to the lake and enjoying cold beverages. I will stay cool this summer by sippin iced tea by the pool . I keep cool by staying inside with the air conditioning on. Hanging out with my daughter during swim lessons! I will be keeping cool this summer by swimming and drinking plenty of fluids, including lemonade! I'll go barefoot, use fans and swim. We pull out the sprinkler for the boys and I sit in the shade with a baseball cap and a HUGE glass of water or juice! I will be spending lots of time in the pool this summer! it's my favorite place to be! I hang out at my pool. We keep cool by going swimming at the public pool! I'll be keeping cool by spending time at the beach or at a pool and drinking lots of Simply Lemonade. Love this lemonade. Thanks so much. We plan to do lots of swimming and fishing this summer. Drinking ice cold lemonade is always good on a hot day! I'll be alternating between air conditioning and my shady deck to stay cool. I am keeping cool this summer with going to the lake and drinking iced coffee. By drinking lots of sweet tea. I will keep cool this Summer by spending time at the pool. I've been keeping cool in the A/C and drinking lots of sweet iced tea. I stay cool by drinking lots of ice water and tea (and staying out of the direct sun). We are keeping cool by spending a lot of time in the community pool. I go in my pool to keep cool. I will keep cool by staying inside with my air conditioning. Lemonade and coconut rum - so good! I plan on keeping cool by staying in the shade and drinking an iced lemonade!! We keep cool here in Florida by going to the beach. I kept cool this summer by having plenty of water, and hanging out near the swimming pool. I added some iced tea and used honey bourbon it came out great!! !